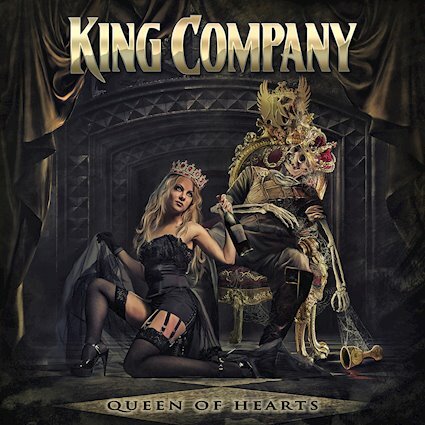 King Company was formed in early 2014. Drummer Mirka ”Leka” Rantanen (Raskasta joulua, Warmen, ex-Thunderstone, ex-Kotipelto, etc) had already been thinking about forming a new hard rock / melodic metal band for a long time. He wanted to play with people with whom he had worked before and who he knew as both good musicians and friends. First, he contacted guitarist Antti Wirman (Warmen) who was also the first to join. The singer Pasi Rantanen was in Mirka’s mind from the beginning, as they had played together in a couple of bands before (Thunderstone, Warmen). After keyboardist Jari Pailamo (Kiuas, Ponies To Kill), and bassist Time Schleifer (Enfarce) joined the band, this super-group was ready to start working. The band’s original name was “No Man’s Land”. In the autumn of 2014 they entered the famous Astia Studio to record their first 3 song demo. Shortly after this Antti Wirman got a temporary gig as the touring guitarist of Children Of Bodom, which limited their rehearsal time, but still the band managed to write more and more material. Co-operation with Heta Hyttinen & Ginger Vine Management began and eventually led to a recording contract with Frontiers Records. This was the band’s dream come true, and the debut album recordings could begin. In 2015 the band played very succesful gigs in Helsinki and Jyväskylä. The nearly sold out venue “On The Rocks” witnessed the band’s first live performance as they played a set full of songs from the upcoming album. After the first gigs began the debut album recordings. The album war recorded and mixed by Janne Wirman and Kal Kaercher and mastered in by Mika Jussila. At this point Frontiers Records suggested a name change to avoid confusion: there already were two other bands by the same name. The band changed its name to “King Company” and released its debut album ”One For The Road” in 2016. I’m going to brutally honest I really struggled with K.C’s debut album One For The Road so I was a touch apprehensive when I heard a second album was on the way however my fears were unfounded. Opening track Queen Of Hearts is a fantastic track reminiscent of Drive, She Saids Drivin’ Wheel, a lightning fast mix of keyboards and drums that sent shivers down my spine and had me hooked before I’d even heard a note of Leonard F. Guillans searing vocals. This album is a superb mixture of melodic hard rock and lighter waving ballads and I loved every minute of it. It’s not very often I say this but in my opinion King Company have achieved something quite rare and it’s an album that whilst there are a couple of slightly weaker songs there isn’t a truly bad track on this CD. What I have noticed while playing this album is that my enjoyment increases with every listen. With Queen Of Hearts King Company have taken the ingredients of early 90’s rock music mixed them together created an album to feast on. I highly recommend that you open your purse or wallet and invest in Queen Of Hearts you won’t be disappointed.